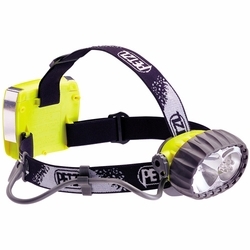 The Petzl Duo LED 5 headlamp builds on the phenomenal success of the original Duo, which garnered numerous product awards. The Petzl Duo LED Duo 5 boasts an even brighter 5-LED bulb to complement its powerful halogen bulb. One twist allows you to easily switch between LED and halogen light for unmatched versatility, efficiency and performance.